The man known as El Greco was a Greek artist whose emotional style vividly expressed the passion of Counter-Reformation Spain. Here at the National Gallery is the most important collection of his work outside that country, which was his adopted home. The haunting intensity of El Greco's paintings—resulting from their unnaturally long figures and strong contrasts of color and light—has invited a kind of mythmaking about his life and art. Following his death, El Greco's work fell into obscurity and, after its rediscovery in the nineteenth century, was often misunderstood. El Greco has been called a prophet of modern art, a mystic, and even a man whose sight was distorted by astigmatism, all misconceptions that have clouded understanding of his distinctive but deliberate style. Born on the island of Crete, Domenikos Theotokopoulos acquired the name El Greco—the Greek—in Italy and Spain. After working as an icon painter in the Eastern Orthodox tradition, he left Crete in 1568 to study western-style painting in Venice. There he was influenced by the Venetian artists Titian and Tintoretto, embracing their rich colors and free, sketchy manner of painting. After about two years he moved to Rome, where artists such as Michelangelo had developed a new mannerist style in which realistic portrayals of the physical world were shunned in favor of a more subjective view, one that existed not in nature but in the intellect. In mannerist works space was compressed, colors were bizarre, and figures became elongated and were intertwined in complex poses. Mannerism, from the Italian word for style, was highly self-conscious and artificial, emphasizing the artist's virtuosity and stylishness. Its intellectual basis appealed to El Greco, who enjoyed the company of scholars and, himself, wrote treatises on art and architecture. Failing to win major commissions in Italy, El Greco moved to Spain. By 1577 he was in Toledo, where he remained for the rest of his life and produced his most important works. In the relative isolation of Spain, he continued to explore and intensify the possibilities of mannerism while his contemporaries in Italy returned to more naturalistic styles. El Greco's style, highly charged and hypnotic, was well suited to the aims of the Counter-Reformation. In the face of Protestant revolt, the Catholic church sought to reform its practices and reinforce belief in its doctrines. Spain put its vast resources—expanded by conquests in the New World—at the service of the church, and Toledo, because it was the seat of the archbishop, played an active role. The Council of Trent, which met in the mid-sixteenth century to clarify Counter-Reformation goals, explicitly recognized the importance of religious art. El Greco, whose patrons were primarily learned churchmen, responded with intelligent and expressive presentations of traditional and newly affirmed Catholic beliefs. His works underscored with powerful images the importance of the sacraments, the Virgin, and saints. At the center of a crowded throng, Christ wields a whip to drive money-changers, merchants, and beggars from the temple. Before the Counter-Reformation, when the church undertook to rid itself of heresy and improper practices, the biblical story was seldom depicted. This is the earliest of several versions El Greco made of the subject and was painted while he was in Venice. The confusing architectural setting and awkward poses of several figures show El Greco still assimilating the pictorial space of western-style painting. But it also indicates that he had adopted the rich colors and sketchy, unblended brushwork of his Venetian teachers. El Greco signed this painting, as he did throughout his career, with his name in Greek characters. 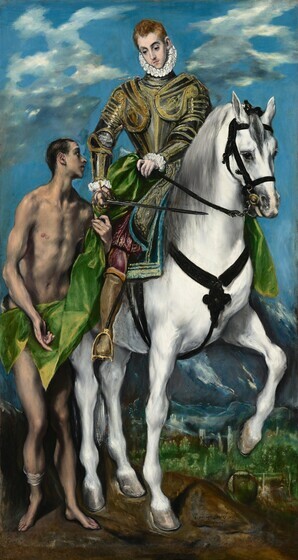 This painting and Saint Martin and the Beggar were part of one of El Greco's most important commissions. They originally hung opposite each other, flanking the central altar in the Chapel of Saint Joseph in Toledo. The Virgin and Child are framed by angels and a billow of clouds. Below are two female saints. Saint Agnes on the right holds the lamb with which she once appeared after her death to worshipers gathered at her tomb. The saint beside her, standing by a lion on which El Greco has painted his Greek initials, is probably Martina. Her name is the feminine form of that of the chapel's founder, Martín Ramírez. It is also possible, however, that she is Saint Thekla, who appeared to Saint Martin in visions. In the painting's original position high on the south wall of the chapel, the two saints would have seemed to stand directly behind the altar table, ready to intercede for worshipers in the heavenly realm. The Chapel of Saint Joseph in Toledo, where this painting hung above the north altar, was established by Martín Ramírez, whose patron saint, Martin of Tours, is the subject here. As a soldier in Roman France, Martin cut his cloak in half to share it with a beggar he encountered. Christ later appeared to Martin in a dream wearing the makeshift cape and saying, "What thou hast done for the poor man, thou hast done for me." Martin was then baptized, and dedicated his life to Christianity. Venerated for his charity, he was zealous in making converts to the church. The figures positioned in the extreme foreground loom as if perched on a high ledge, while the background recedes quickly to a distant vista—not of Amiens where the story took place, but Toledo. Time is likewise transformed as the fourth-century saint wears contemporary armor. These deliberate shifts of time and place hint at Toledo's role in the Counter-Reformation, suggesting that all Toledans should emulate the saint's charitable behavior. 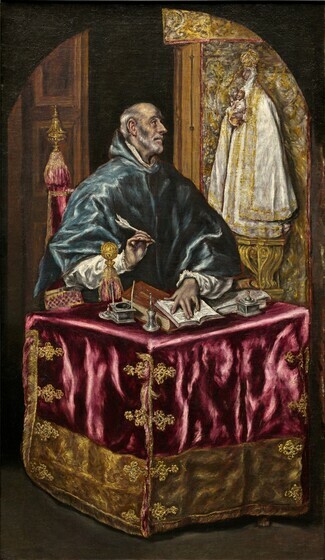 A small replica of this subject, one of five known, may have been painted by El Greco's son, Jorge Manuel Theotokopoulos. 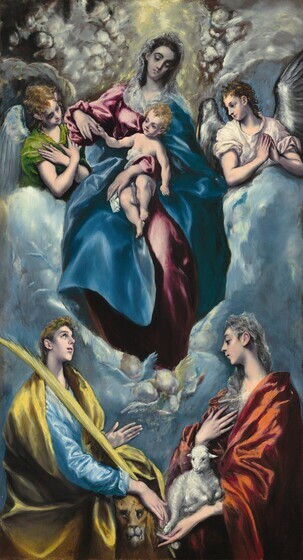 It provides an instructive comparison with El Greco's own works. Here the brushstrokes are shorter and more hesitant; the elongated figures of the original are further distorted; and the saint's serene expression is transformed by the twisting curl of his lip. The powerful and enigmatic Laocoön is El Greco's only surviving treatment of a mythological subject. The story relates how the hero, a priest in Troy, attempted to warn his countrymen of the Trojan Horse, whose hollow body concealed Greek soldiers. Laocoön was punished by the gods, who sent serpents out of the sea to kill him and his two sons. A famous ancient sculpture of Laocoön, which El Greco must have seen, was unearthed in Rome in 1506. Like it, El Greco's painting depicts the climactic moment when the bearded priest struggles for life. One son lies dead, and the other will soon succumb. 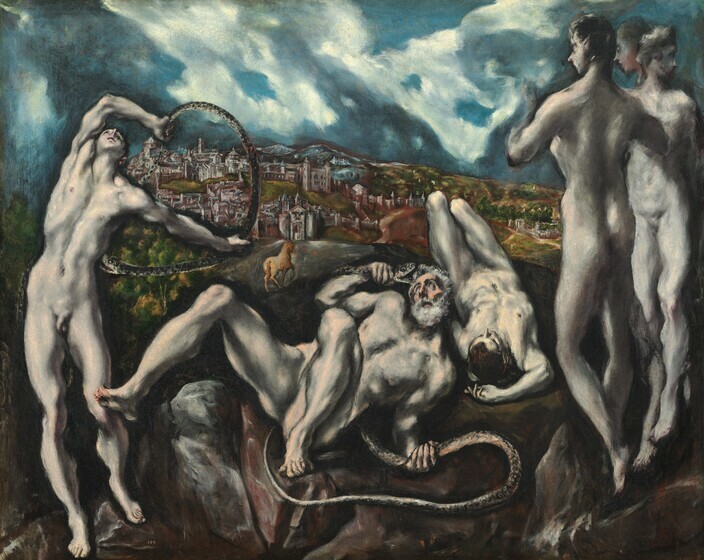 But El Greco placed these mythological characters and the Trojan Horse against the backdrop of Toledo. At the right stand two figures, perhaps gods viewing the scene. They are complicated by a third head and the leg of an unfinished figure. These mysterious figures and the view of Toledo have prompted many speculations about El Greco's intention. Is this a reference to a contemporary religious controversy, a moralizing allegory, or an allusion to the tradition that Toledo was founded by descendants of the Trojan heroes? Probably it is impossible to know. It may simply be that El Greco was motivated to match the virtuosity of a famous ancient statue with his own masterful invention. A visitor to El Greco's studio wrote of seeing small versions of the painter's most famous works. They provided models for clients who wished to have copies made—such as the smaller Saint Martin painting also in the National Gallery of Art collection—and they also allowed the artist to work out compositional changes. Though unfinished, The Holy Family is essentially a record of the larger original and a basis for a second version. 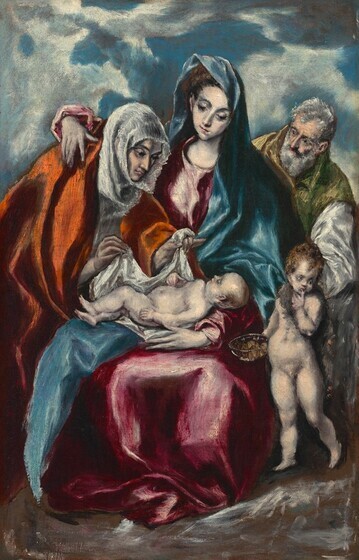 In this painting El Greco experimented with the figure of Saint Joseph, making him older than in other versions. This reflects debate in the Spanish church about Joseph's age at the time of his marriage to the Virgin. This scene, in which the Virgin's mother, Saint Anne, and the infant John the Baptist join Mary and Joseph in admiring the sleeping Jesus, is not described in the Bible. It is one of El Greco's many inventions intended to further the aims of the Counter-Reformation. The complex symbolism of the Holy Family suggests Christ's eventual death and resurrection, hinted at by the infant's deep sleep and by the way he lies in his mother's lap. This pose, known in Italian as the pietà (pity), is most often used to show the Virgin holding her son's body after his crucifixion. Saint Ildefonso, a seventh-century archbishop and the patron saint of Toledo, interrupts his writing to gaze devoutly at a statue of the Virgin. In the sixteenth century the saint was accused of heresy by critics outside Spain, and this composition, which includes Ildefonso in the company of Saint Jerome and other divinely inspired scribes, reinforces the saint's authority. Scintillating colors and flickering white accents amplify Ildefonso's emotional intensity. The nineteenth-century French painter Jean-François Millet, who owned the painting and hung it over his bed, remarked, "you'd need a lot of heart to make a work like that." Millet and later Edgar Degas (who bought Saint Ildefonso from Millet's estate) were largely responsible for the revival of interest in El Greco's art, but their emphasis on his emotion and "modern" technique also clouded understanding of the painter's relation to his period. The Counter-Reformation renewed emphasis on penance and other sacraments attacked by Protestants. Here Saint Jerome, who translated the Bible into Latin in the late fourth century, has retreated to the desert. He holds the rock he will use to beat his chest in punishment for loving secular learning too much. 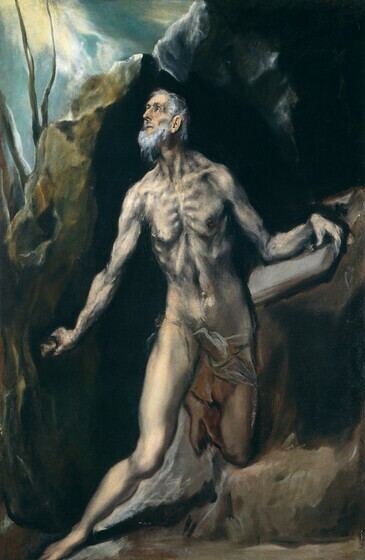 This unfinished painting provides evidence of El Greco's working method. He began with a ground coat of dark reddish brown, still visible in many places. He outlined the figure with heavy dark contours, as in Jerome's lower left leg, then used thin, fluid strokes of lighter paint to define the body, as the right leg reveals. With a stiff brush and thick white paint he enlivened some parts of the anatomy, most noticeably the torso. And in completed areas such as the saint's face, he smoothed these jagged contours. 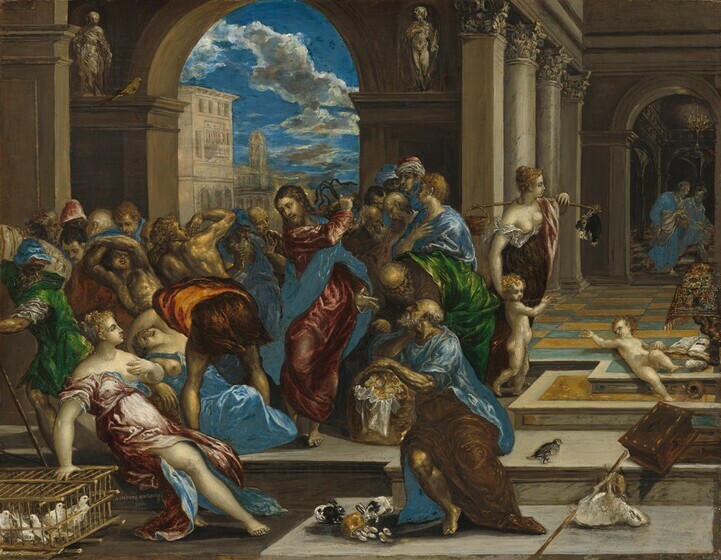 This is one of the most dramatic paintings produced by Tintoretto, whom El Greco considered the greatest artist after Titian. Its striking illumination, sketchy brushwork, and haunting effect are found in El Greco's own work. Christ stands at the Sea of Galilee after his resurrection, telling his disciples from the shore to cast again their empty nets. 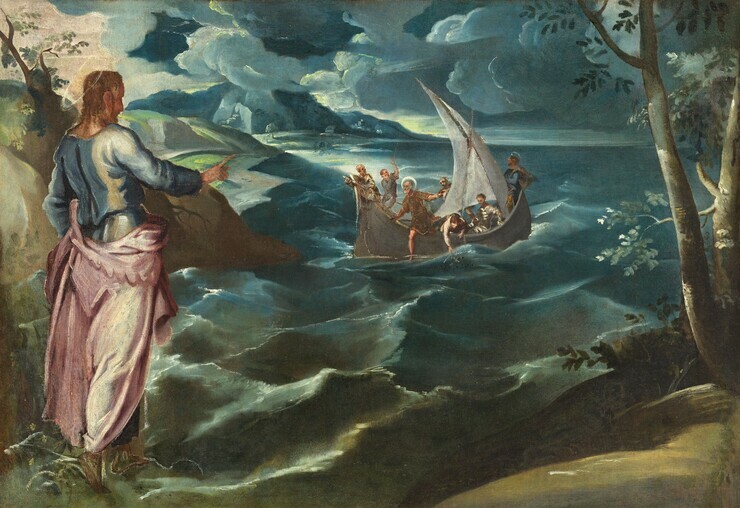 As they draw up a multitude of fishes, Simon Peter leaps from the boat in a swirl of activity similar to the crowded mêlée in El Greco's Christ Cleansing the Temple.